Be careful when using chemicals. Many people enjoy their back yard pools in summer, and a good knowledge of swimming pool chemical storage safety is an important part of being a responsible pool owner. These powerful products can cause chemical burns if mishandled. They may also present a health hazard if inhaled. Proper safety precautions must be followed at all times. 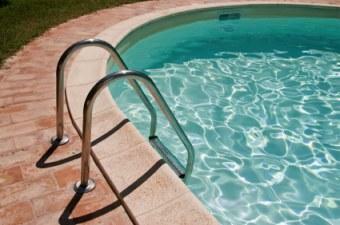 Pool chemicals are meant to be dissolved in large quantities of water. If they are mixed with small amounts of water or mixed improperly, the reaction may cause injuries, dangerous vapors, or damage to property in the form of a fire. Certain chemicals used in swimming pools will break down over time, even if they are kept dry, with negative consequences. Care should be taken when storing pool chemicals to avoid spilling on the pool deck or the ground. You need to be mindful of the environmental consequences of choosing to use these products, and you don't want them contaminating the soil or the ground water. Make sure that all cleaning products and chemicals are stored out of reach of children and pets. Avoid storing pool chemicals near other flammable materials. Containers should be kept tightly closed when you are not using the chemicals. Keep pool chemicals in a cool, dry place. Make sure that the area you choose is well ventilated. Avoid storing the pool chemicals on the floor. Don't place containers of pool chemicals on top of each other. Read the label on the container before using chemicals and follow the instructions carefully. Avoid inhaling the dust or fumes from pool chemicals. Chemicals should never be mixed together, since the reaction may cause an explosion. If you need to mix water and chemicals, add the chemicals to the water instead of adding water to the chemicals. The mixture may splash out of the container onto your skin, causing irritation or a painful burn. Don't place a wet scoop back into the container after measuring pool chemicals. Make sure that pool chemicals don't come into contact with your hands, mouth or eyes. Wear gloves and protective eyewear when working with these products. Since some pool chemicals are corrosive in nature, make sure your skin is covered while using these products. Wear a shirt with long sleeves, and opt for pants instead of shorts when mixing and adding chemicals to the pool. Your feet should be covered, as well. Wear sturdy shoes that cover them completely, instead of sandals or flip-flops. You will want to avoid slipping or falling while working with pool chemicals. In a situation where a pool chemical is swallowed, check the label for instructions on what to do. Contact the Poison Control Center (1-800-222-1222) or go to the Emergency Room for treatment. Be sure to take the container with you so that medical personnel know what has been ingested. Don't add chemicals to the pool water while the pool is in use. Instead, choose a time when there are no swimmers using it. Don't smoke while working with chemicals; the chemicals (and the dust they create) may be flammable. Chemical containers should not be used for any purpose other than storing the original product. These swimming pool chemical storage safety suggestions will help to minimize the risk of injury when you are attempting to keep your pool clean and sanitary for the people who enjoy using it.